Title: PETITS CONTES DE MA NOURRICE ou les Feeries Amusantes par le Papa Bronner. 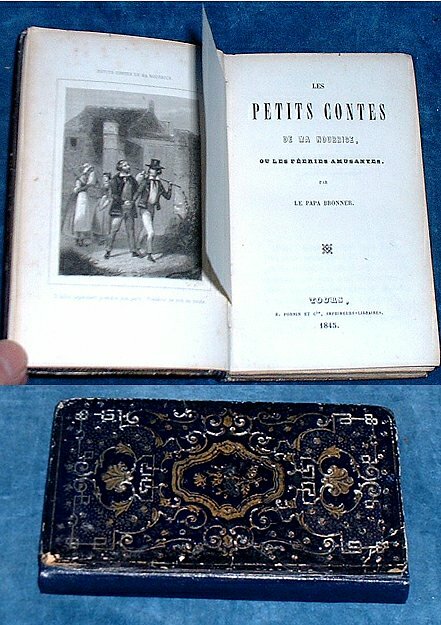 Description: Tours France, R. Pornin et Cie. 1st edition 1845 Frontispiece with tissue guard. . 140x85mm dark blue gilt embossed cartonage romantique (rebacked in plain dark blue/gilt rubbed) contemporary Brussels bookseller label to pastdown and inscription to Miss Applin dated 1848 to front free endpaper. Half title + approbation leaf + frontis + titlepage + iv + 172pp. Twelve stories for children in a neat tight volume.